And now something to relax and soothe the brain after all the vexatious stuff. If the ISS has done nothing else, its public outreach has provided humankind with a wealth of images. Dr. Kjell Norwood Lindgren is a NASA astronaut on the ISS since July this year. 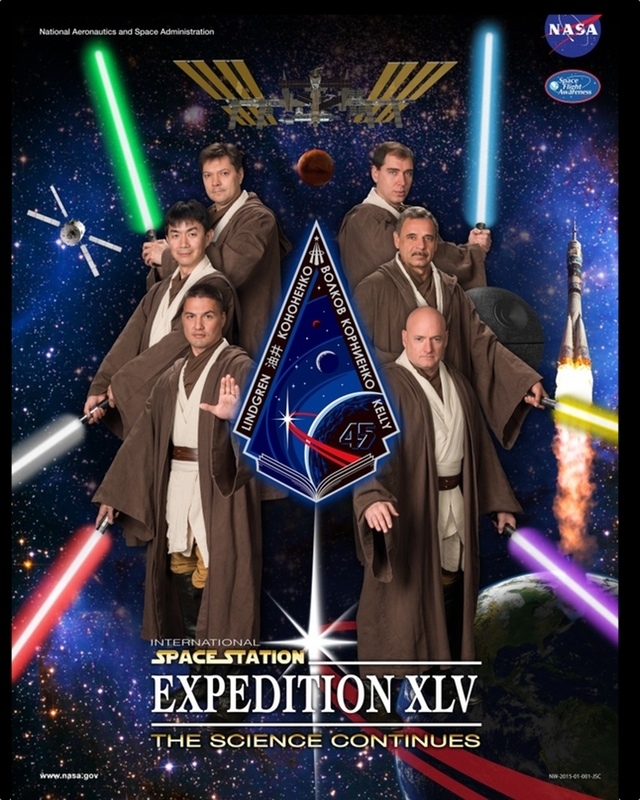 His team posed for this delightfully nerdy poster to commemorate their mission. This entry was written by whyevolutionistrue and posted on September 6, 2015 at 3:00 pm and filed under space exploration. Bookmark the permalink. Follow any comments here with the RSS feed for this post. Both comments and trackbacks are currently closed. That’s why I decided not to be an astronaut. Looking at aurora borealis is still on my bucket list. Not too delightful, his team is alll guys. I was kind of sorry to see Samantha Cristoforetti leave orbit. OK, that is the coolest NASA commemorative picture ever. You don’t agree? Why is nerdy an insult? It should be a compliment – most of the most interesting people are nerds. But being a nerd doesn’t increase the probability of being interesting. Obsessing over Star Trek, Star Wars, comic books, or Dungeons and Dragons is a bad sign. Does being a jock (or for that matter a CEO or a Kanye Westesque “artist”) increase the probability of being interesting? An interesting person is one who can convey knowledge in a way that is meaningful to the listener. I’ve run into carpenters who could do this and test pilots who could not. Nerds tend to lack the social skills to do this effectively, because it does require an ability to get into the head of the listener. Being a jock doesn’t mean that you aren’t a nerd. If all you do and think about is football, you’re a football nerd and just as boring as the guy learning to speak Klingon. So, to answer your question, it depends. That is a good point. Especially on carpenters and small engine mechanics, in my personal experience. They can be amazingly wise and intelligent. Liking Star Trek is good – obsessing is bad! A fine poster! Thank you very much, I like it. Thomas Hardy approves your title. So, if one of Mission 45 needs to do an EVA (“Open the pod bay doors, HAL”) to fix something in the supports for the solar panels, will he have gone over to the dark side?